There is nothing, or possibly very little, by way of music and dance in Latin America—and that includes Argentina—that is not a result of the direct collision of Natives, Africans and Europeans. For instance despite the fact that politically-inclined Argentineans like to believe that the “Tango” was a Spanish-Argentinean invention, “Tango” is a dance that has influences from European and African culture and it is almost certain that dances from the Candombe ceremonies of former slave peoples helped shape the modern day “Tango.” The word “Tango” comes from the Niger-Conga languages of Africa. The dance derives from the Cuban Habanera, the Argentine Milonga and Candombe, and is said to contain elements from the African community in Buenos Aires, influenced both by ancient African rhythms and the music from Europe. 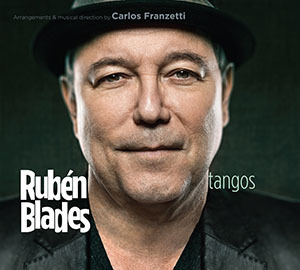 With this in focus it is possible to truly enjoy the re-arrangements of Rubén Blades’ compositions by the ineffable Carlos Franzetti on this important record, Tangos . There is no harsh emphasis of the violent wrenching of slaves from their home countries of the Congo and other parts of Africa, but rather, here is the elegant accenting of African polyrhythms of Candombe melded in with the sliding grace of the Habanera and the delicate touch of the Milonga. Of this and other expressions Mr. Blades, born in Panama, is a master as if he was native of Buenos Aires. The vocals engage the immensely beautiful playing of four bandoneóns in the Leopoldo Federico Orchestra that includes a nonet comprising five violins, a viola, cello and bass together with a pianist. 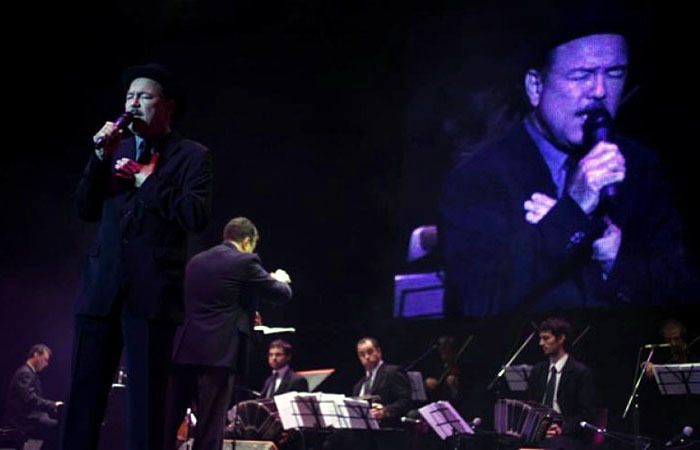 All of this directed by Mr. Franzetti, who seems to anticipate every nuances uttering by Rubén Blades, and is there for him when he arrives at that point in each song. For his part, Mr. Blades is spot on when it comes to interpreting his music in an idiom that is almost foreign to him, so much so that he becomes a native Argentinean for the next 48 minutes of this recording. Mr. Blades’ response to such brooding flights of fancy shows in his invention, which comes from a distilled mastery displayed in the entire song-cycles of this repertoire with melody accompanied by chords, rocking back and forth. Most of the repertoire would be hard to sustain if it were not for Mr. Blades’ ingenuity. Of course to enjoy it is important to be willing to enter Mr. Blades’ world which is now a highly familiar network of interpretative techniques—vocal quivers and songs line that end in delicate vibrato, soaring outbursts, etc. Thus it is easy to gain an enjoyment in these seldom-travelled musical paths with both the Leopoldo Federico Orchestra as well as the quintet that now includes Carlos Franzetti on electric piano and the excellent bassist Pedro Giraudo. Mr. Blades is in excellent voice throughout and never so heedless as to be mannered. 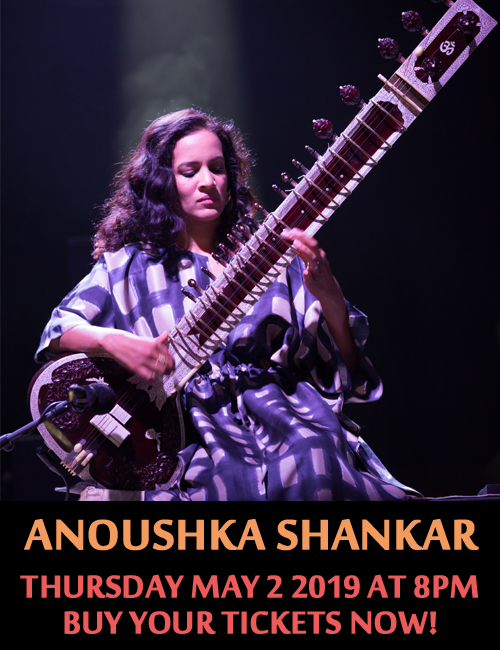 He is particularly keen to conjure visual images in songs such as “Paula C” and “Pedro Navaja”. Much credit ought also to be given to Mr. Franzetti who so clearly charts the progression of Mr. Blades’ musical thoughts, especially when the composer radically varies any given gesture with the change of but a single note. Personnel: Rubén Blades: vocals; Leopoldo Federico Orchestra—Carlos Franzetti: Arrangements & Musical Direction: Leopoldo Federico: bandoneón (1 – 5); Carlos Corrales: bandoneón(1 – 5); Federico Pereiro: bandoneón; (1 – 5) Lautaro Greco: bandoneón (1 – 5); Damian Bolotin: violin (1 – 5); Pablo Agri: violin (1 – 5); Miguel Angel Bertero: violin (1 – 5); Brigita Danko: violin (1 – 5); Mauricio Svidovsky: violin (1 – 5); Benjamin Bru: viola (1 – 5); Diego Sanchez: cello (1 – 5); Nicolas Ledesma: piano (1 – 5); Horario Cabarcos: bass (1 – 5); Daniel Binelli: bandoneón (6 – 11); Leonardo Suarez Paz: violin(6 – 11); Carlos Franzetti: electric piano(6 – 11); Francisco “Pancho” Navarro: guitar(6 – 11); Pedro Giraudo: bass(6 – 11).